While visiting family in Asheville, NC for Thanksgiving this year, we spent an afternoon at the Omni Grove Park Inn where our niece’s class had an entry in the National Gingerbread House Competition™. Happily, her class won first place in the Youth Division this year! The Inn, which opened in July 1913, is on the National Trust for Historic Preservation’s list of Historic Hotels of America. You don’t have to spend the night or a lot of money to enjoy much of what the Inn has to offer. 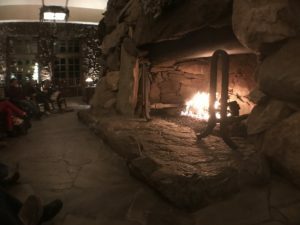 Relax in a rocker by a big toasty fire and soak in the atmosphere in the grand but cozy stone and wood lobby. Meander the halls and check out the photos of famous guests along with cases displaying historic photos and documents. Check out the shops and have a drink, snack or meal in one of the many restaurants or cafes that are on the property. After checking out the fabulous Gingerbread House Competition entries, we enjoyed a beautiful sunset from the patio, sipped hot cocoa and lattes and took in some incredible views. 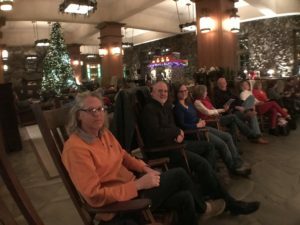 And before we left, of course we had to spend some rocker time in front of one of the two huge fireplaces in that grand but cozy lobby! 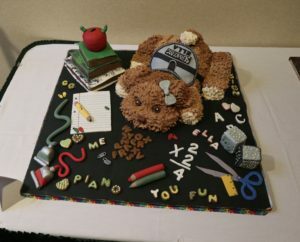 It was a lovely afternoon strolling around the Omni Grove Park Inn and checking out the amazing gingerbread creations. 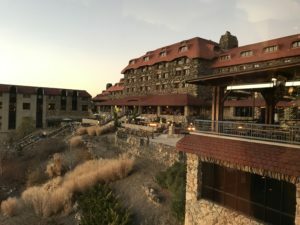 If you’re planning a visit to the Asheville area (and you won’t be staying at the Omni Grove Park Inn), consider spending a leisurely afternoon exploring this wonderful property. They even offer a guided history tour at 9:00am on Wednesdays through Saturdays (free for overnight hotel guests; $10.00 fee for day guests), if you’re so inclined. You won’t be disappointed!